Normal hours are 8:00 a.m. - 5:00 p.m. Monday through Friday. If you need an officer outside of business hours, a phone is located inside the outer doors of the Police/Courts Building on East Jefferson. This phone is connected to the county dispatch center. An officer will be contacted to assist you. The Goshen Police Department was established in 1868 with the appointment of the first marshal, H.C. Hale. The first Chief of Police was Edgar J. Vesey hired in 1914. The police officers did not carry portable radios until the 1970s. The use of computers in the department began in the 1980s. The department has 64 sworn, full-time officers, 1 special police officer, 5 sworn reserve officers, 6 civilians, and 3 part-time ordinance compliance officers. If your community group or organization would like to have someone from the Goshen Police Department speak about a certain topic, please contact the department (533-8661) and a qualified individual will be assigned to speak to your group. Reserves are unpaid volunteers who are assigned to special activities such as local high school events. To find out more about becoming a reserve, contact the department at 533-8661. 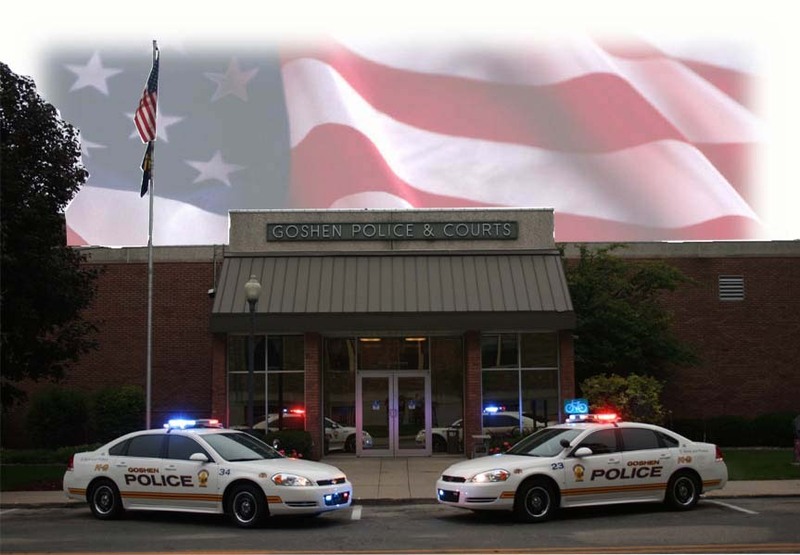 The Goshen Police Department provides Goshen Community Schools with three (3) Resource Officers: one is assigned to the High School; one is assigned to the Middle School; and one is assigned to the elementary schools. The Police Department wishes to acknowledge the loss of Patrolman, Tom Goodwin. Officer Goodwin, an eight-year veteran of the police department, was killed in the line of duty on December 11, 1998. In the spring of 1999 Tommy's Kids Castle playground was dedicated in honor of Officer Goodwin. A team of 1,800 volunteers headed by Kiwanis constructed the playground in three days. Donations from local businesses paid for the materials needed for the construction.